The first stage of the Camino Inglés-or Irish-begins on the shores of the Atlantic, in the port of Ferrol Curuxeiras. It is a journey silhouetted along the Ártabra coast, until the final goal of Pontedeume. The inner harbour of the naval city, along with that of A Coruña, were the historical landing places for pilgrims from northern and western Europe, a reference point since the first marches to Compostela, dating back to the XIII century and sponsored at the dawn of the Camino by the order of the hospital Espíritu Santo (Sancti Spiritus, founded around 1175 by Guido de Montpellier in France). Proof of this is that along this route, as with other pilgrimages, the place names Magdalena and Malata repeated several times in reference to where the pilgrims stayed to die, in the first case, or in the second where placed in quarantine. The pilgrim faces a gentle day in the first half of this stage, although later more difficult they move away from the moderate slopes to the margins of the estuary of Ferrol. From the medieval port and the next well designed departmental neighbourhood of A Magdalena, an example o the Enlightenment period, the path, well marked for the most part of the stage, gradually leads up to a modest altitude, less than 200 meters to descend again to sea level to the mouth of the river Eume, where you will find the legendary city of Andrade and one of the gateways to the natural park As Fragas, the unique ecosystem in Europe and an example of the Atlantic Forest. Especially with rain, the Camino has several sections that become muddy thus complicating the journey on foot or by bicycle. However, asphalt or gravel roads dominate the route, resurfaced and signposted at the beginning of the nineties. Up to three historic centres are passed in the opening stage of the English way, namely, Ferrol, Neda and Pontedeume, each one with centenarians corners that are a great treasure of architectural and cultural value. Neither finding supplies or services will be a problem at this stage, with all types of establishments in a short distance from or directly at the foot at the path. The English route itinerary begins at the Council of Ferrol, specifically the port of Curuxeiras (km 0). 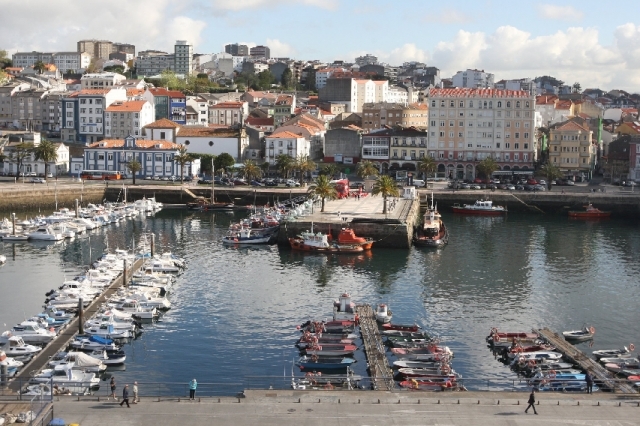 This starting point of the pilgrimage to Santiago, according to sources consulted from the Consorcio do Camiño Inglés (English Camino Consortium), emerged as a destination of fortune, as it was the port of A Coruña that provided customs permits for the unloading of goods and passengers. However, changeable weather conditions often forced them to seek refuge in the harbour of Ferrol or other smaller ports in the area, which eventually were incorporated as a destination. It is in this medieval town (XI century) where pilgrims began the walk. There is a municipal office of Tourism, however, it is only open on Saturdays and Sundays, although the customer service opens every day of the week in summer and the week of Easter. The Camino passes thru the battered narrow streets of Ferrol Vello neighbourhood, origin of the current naval city. At the beginning of this step, the route has been is modified due to a fence around Carmen Curuxeiras Street due to the recent collapse of old buildings, declared of Cultural Interest (BIC). The modification takes a detour to the right, towards Benito Vicetto Street (an old street of the prison) to rejoin again the established route (turn left and up a gentle slope), via San Francisco street, whose church defines the neighbourhood ordination of old neoclassical La Magdalena. The Church of San Francisco Just a few steps ahead to the left you leave the park of Reina Sofia (former garden of the Franciscans) and on the right the Parador Hotel Jardines de Herrera and then, the old building of Capitanía. The route continues along the Calle Real and enters the neighbourhood of A Magdalena, an example of urban Enlightenment. The Marqués de Amboage square, in honour of the famous Ramón Pla y Monge from Ferrol, on left of the route and where you will find the Dolores Chapel (XVIII century), which marks the entry into the most central part of the city. At this point, it is worth taking a detour of a few meters to the right to visit the Cathedral of St. Julian's (San Xiao), patron of the city (January 7), situated on Iglesia Street and close to the food market. Besides being the most important religious enclave of the city, the pilgrim can receive the credential of the Camino upon a payment of 80 cents. Viewing the Magdalena neighbourhood, the Jofre theatre, the “Con-Cathedral” of San Julian, and the (Cuartel de Instrucción) headquarters of Instruction Back on the route, the Calle Real Street passes in front of the Armas square and the Municipal Palace, erected in 1953. The path runs down the street of Carmen, Plaza del Callao square and Cantón de Molins, to the church of Angustias, another neoclassical temple of Ferrol. Already in the neighbourhood of Esteiro, pass in front of the old shipyard of Navantia –former Bazán-, the Tercio Norte, a well known Navy troops founded in 1771, and the university campus of Esteiro (left). A slight slope leads the way to the neighbourhood of Caranza along a cycle lane at the edge of the river, until reaching the industrial state of ​​A Gándara. It takes you to the council of Narón (20 kilometres to Pontedeume / 110 to Santiago), the fourth most populated city in the province of A Coruña. It has all the services, altough not to on the Camino route, including saddlery establishment (Comercial 2000, telephone 00 34 981 384 848) for the horse trail, and bicycle and repair shop (Ciclos Roca 00 34 981 313 674 and Bici Total 00 34 981 370 850, both located on the outskirts between Ferrol and Narón). After crossing the busy junction of Avenida de As Pías you reach a deviation to the right to continue along Avenida do Mar. It is a flat route that follows the course of the river until you reach a roundabout where you turn left to go uphill. A few meters later, a right turn leads the route along an overpass which leads to a narrow gravel path parallel to the railway line. It shares the route with the pilgrimage to San Andrés de Teixido (Cedeira). The path crosses to left of the railway line via a small tunnel to reach an urbanized area, leading to the Rúa da Pena. At this point, there are two signs to the Camino with yellow arrows (to an earthy slope) and a milestone with a scallop shell. The second sign in front of the Jacobean route recommends you to continue a few hundred metres uphill. Once reached, the route leads to the monastery of San Martiño de Xuvia (O Couto). The monastery of O Couto Here the stop there is a must, altough not always open to the public. Founded at the end of VIII century and reconstructed in the XII century under the sponsorship of the la Casa de Trava, it was the priory of the abbey of Cluny (Burgundy) and one of the most influential monasteries in northern Galicia. It is the most representative monument of Narón. Conserving its romanesque church and a for a little over three decades, restoration work uncovered several medieval tombs, including that of the knight Rodrigo Esquío, dated XV century. Also inside, a collection of fifty pilar capitals and corbels with vegetal figures, monsters and allegories of the underworld, in the style of Compostela. The monastery was the retirement destination of sons of kings and members of high nobility. Go up to the front entrance of the monastery via an asphalt track, where the path continues to the junction with the road to O Salto, the land that also shares a stretch with the pilgrimage to Teixido. The estuary can be seen on the right of the route and the AP-9 bridge in front. The forest trail of earth and stone, is good and strong at the beginning, but the mud on rainy days, complicates the route a few meters ahead. Leading from a pedestrian overpass that is crossed to continue again on the dirt track. It continues around the power plant company Fenosa and leads to another rocky path, about 200 metres, which connects with a paved path, signed with yellow spray-painted arrows, signaling a right turn downhill. It comes back to sea level, to the shore, where the route meets the mill As Aceñas, dating back to the XVIII century. The end of this sea stretch, with a turn to the right that crosses an asphalt path leading to the A Riveira walk and leaves on the left Megasa, an industrial metallurgy. A pleasant route, suitable for pedestrians, with a cycling path and green areas, it continues to a modern footbridge with two arches. Once across, you enter the council of Neda. The first thing you find is the public hostel (14 kilometres to Pontedeume / 104 to Santiago). The itinerary is resumed along another stretch of path on the opposite side of the river, reaching a network of wooden bridges over the marshes of the River Belelle. The church of Santa María de Neda flanking the Camiño do Paraíso, gateway to the town center. On leaving behind the temple across the road there is an internet-café with vending machines and after a passage over a wooden bridge with reduced dimensions, ventures to the previously mentioned route Camiño do Paraíso. The Clock Tower in Neda Already lit up and visible from the Calle Real, marked with a scallop shell on the ground, the XVII and XVIII century style houses lead to the Clock Tower (1786), a former pilgrim hospital Espíritu Santo and now the town hall. Distancing few meters from the road, towards the main road (AC-115), the centre of Neda has bars, restaurants, grocery shops, a supermarket, banks and a hardware store, among other services. But continuing along the Calle Real, towards Castro Street, there is a grocery store Coviran and, later, an establishment with a shop and a bar, Casa Ríos. It involves a short diversion of just a few meters, but necessary to visit the church of San Nicholas (XIV). Going back a few steps, you return to the route through the square of Rectoral and Avenida Morgado. At the junction with Avenida Castelao, you find the bar Hermida offering breakfast to pilgrims or snacks any time of the day. A gentle descent under the huge bridge that crosses the main road, with the train station at the bottom, later you turn left and begin to climb until the road. Advanced a few hundred metres above the AC-115, crossing to the left to continue to the Labora Factory. The walker faces the first slope in this difficult stage. Upon completion, the panoramic view of the Estuary of Ferrol justifies the climb. A descent leads to O Puntal de Arriba. After turning left, for Conces, you come to a fork at which you also turn left, to a drinking fountain and a outdoor washing sink. It is the beginning of the council of Fene (9 kilometres to Pontedeume / 98.5 kilometres to Santiago), an industrial town and home to shipyards and the ship repair workshops Astano (now known as Navantia). Just like Narón or Neda, the Fene has all kinds of services. You enter the centre by Rúa do Campo street. To the right of the route you leave the Casa da Cultura of the town (House of Culture) and take the Rúa da Casa Vella street. It's a well signposted stretch that leads to a junction on the left, here you turn right towards the National Road N-651. You just have to cross it to follow the route. It is this area of bars where it is possible to purchase supplies. The route continues ahead in front of the Casa Constitucional (Town Hall, an area that has postal services, a health center and a local police station). At the end of the road turn left and, immediately afterwards, via calle Gerardo Díaz the path moves away from the city centre on a paved road where there is a house and at the foot of its wall you will find an arrow sign in the form of scallop shell and a plaque indicating the pilgrimage to Compostela. About a kilometre further ahead you reach Lavadero de Mundin (an outside washing area) that marks a shift to the left and a climb to a dirt track on the right. It is the genuine Camino as in previous stages the route is complicated especially with rain. The forest trail, with steep inclines, crosses through a 90 degree bend below a motorway overpass. Continue to Rego da Moa and along a narrow orchard stretch, behind the petrol station. Parallel to the main road, there is a newly opened path from the industrial state of ​​Vilar do Colo, the highest point of this stage, nearle 200 metres of altitude. Already in the business park, a sign warns of a temporary diversion due to building works. Opposite the sign there is a service station with a cafe and a shop, open every day. At the end of the industrial state, following the signs for the temporary diversion you reach a path that borders the mountain road at the end of the industrial state and following the temporary diversion signs continue right and then immediately left to an asphalt road. With a right turn, you cross over the AP-9. This stretch now belongs to council of Cabanas (2 kilometres to Pontedeume / 91 kilometres to Santiago). The next place is Pena do Pico, where you connect with the road again. After passing an area of ​​mills and a stream, in a place called O Val, you reach the main road of Cabanas, which must be crossed to follow the route, next to an old modernist villa. At this point, a path of barely a few metres to the right on the same road leading to the a branch of the Priory Mill, still in operation, you can visit the church of San Martiño do Porto, its beautiful Late Baroque style entrance, comstructed in 1788 by the order of the Archbishop Bartolomé Raxoi e Losada. An image of the equestrian Saint San Martiño guards the entrance to the temple. Back on the path, a few steps ahead and next to a fountain the path leads to the tunnel of a train on a sharp descent. From here, the pilgrim can see the beach of Magdalena and the fabulous pinewood forest Cabanas, in the estuary of Eume, a good place for a snack because it is an area with several local restaurants and a supermarket with a vending machine outside . Walkers will also find a local train station stop and signs for the town’s tourist office, a few metres away. Following the walk, along the pine forest, the last steps of this stage, you reach the bridge over the river Eume, constructed under the patronage of Fernán Pérez de Andrade, Lord of Pontedeume, in the XIV century. Once across the secular bridge, that leaves on its left the Nature Park of Fragas do Eume you reach the end of the stage, in the heart of the village of Pontedeume (Betanzos 19 kilometres / 89 kilometres to Santiago). Just at the end of the bridge, on the right, you find the pilgrims public hostel. It is a stone ground floor building, near to the fish market and sports pavilion. To access the hostel you must call 00 34 682 469 004 (Monday to Friday) or 00 34 626 352 069 (Saturdays, Sundays and bank holidays). 1 reviews Distance to Santiago: 117 km. 1 reviews Distance to Santiago: 102 km. 1 reviews Distance to Santiago: 90 km. 1 reviews Distance to Santiago: 99 km.